Like the headline reads, the 4th of July was a busy, productive and fun weekend in the Adirondacks. Lake Placid tourist activities and events certainly benefited from the lovely summer weather. But, on a more selfish note, the beautiful weather helped us make great progress on building our new home. As you can see in today's featured photo, the crew erected all second floor posts and beams of the new house! We also managed to consume a fair amount of food and beverages, go for a flying cliff dip at the flume, drive all the way to Donnelly's for ice cream, visit with old friends and enjoy the fireworks in Lake Placid. I plan to post more detailed photos, so stop back if you'd like to see what went into making that second floor. 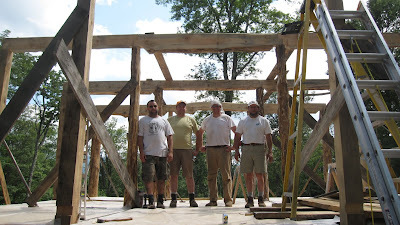 Pictured in today's photo is the 4th of July building crew, a motley collection of avid builders with day jobs: a rocket scientist, a mechanical engineer, a software engineer/programmer and a wildlife biologist. They all have experience building and working with wood; our computer programmer is also a professional builder. A motley building crew with big hearts, creativity and hearty laughs is more than any family could hope for! Aaaaand....we received wonderful, exciting cool news. JSR , WHERE WERE YOU ? WERE YOU HAMMERING ANILS OR MAKING SPAGHETTI ?